For over three centuries, Kolkata has quietly observed endless invasions, migrations and exodus which have literally made our ‘tilottoma’ a melting pot of diverse cultures. While most of them have etched a mark in the city’s art, architecture and heritage, they have also engraved their presence in the culinary art. From Bagbazaar to Territi Bazaar, Kolkata’s length and breadth consist of a plethora of enthralling gastronomic experiences. From moya to mutton, pitha to papad, Bengal’s love and passion for great tastes have all the ingredients to become an intriguing research paper. Bengal, very interestingly, has gone beyond its boundaries to embrace food from other parts of the country and even from Europe, middle – east and Far east. Come and be a part of this drooling journey across the most sought-after dainties of Bengal and the celebrations, seasons and cultures connected with each of them. Paanchphoron is a new section from Ei Samay featuring anything and everything linked to our taste buds along with recipes, exciting workshops and cooking tips ! Keep an eye on the page to be a part of its unmissable activities. Pithe: The last day of the Bengali winter month Poush across Bengal is celebrated by cooking a variety of dishes together called Pithe. Pithes can be stuffed with various vegetables, with coconut and gur, with sweetened khir. Again, pithes come in all shapes and sizes, from simple round dumplings and rolls to intricately designed half-circular shapes. Made largely of rice flour, obtained from freshly harvested paddy, the real zing in most pithes come from the amazing aroma of the notun gur, fresh date-palm jaggery. Recipe: Soak the earthen bowls-shwora’s overnight in water the day before. Next day dry the earthen bowls. Now, mix the rice flour with the lukewarm water together with a pinch of salt and make a mix. Now on a low heat/flame place the “shwora” and add the kick to it. Cover and let it cook. Check to ensure that it is not dry. Once it is completely done remove with the help of a spoon or a knife. Serve hot with desiccated coconut and nolen gur. Recipe: Lightly roast the rice in ghee. Boil milk and then add the roasted rice to this. When the rice is cooked slowly add in the jaggery whilst stirring continuously. Also, add in a pinch of salt- this prevents the milk from splitting. When the milk thickens remove from heat and serve warm or cold (as per preference). This delicacy is not only prepared during makar shankranti but it is also often made during janmastumi - to celebrate the birth of lord krishna. This was apparently lord krishna’s favorite hence the name “gokul”. This pithe is flatter rather than dome shaped. Recipe: Add dessicated cocunut, khowa kheer (recipe above) and a little bit of semolina to a pan/wok and mix until it leaves the side of the pan. Take a small amount to check if you can roll it on your palm to make a ball and if it is holding its shape. If it is you are done. Roll out similar balls and flatten it by pressing your palms together and keep aside. Now make a thin batter out of flour, semolina, milk and a little bit of nolen gur. This should be thick enough to coat the balls. Now dip the flattened balls in this batter and deep fry in vegetable oil and ghee mixed together. Make a thin sugar syrup by heating sugar and water together till you get a syrupy consistency. Add the fried flattened balls to the syrup let it soak for a bit and remove and keep aside. Gokul pithe is ready to eat. Recipe: Mix the rice flour with a pinch of salt and water to prepare a dough. Now divide the dough into small portions and shape each one into small thin slightly elongated shape ( should resemble the grain of wheat). Let these rest so some of the moisture is absorbed. Now mix the jaggery with the milk and heat till it comes to a boil and stir continuously till it thickens a bit and add the prepared portioned dough shapes and continue boiling for a bit and then remove when it thickens. Careful when you are adding the dough to the milk add in small quantities so that they may retain their shape. Also ensure that you do not over-boil. 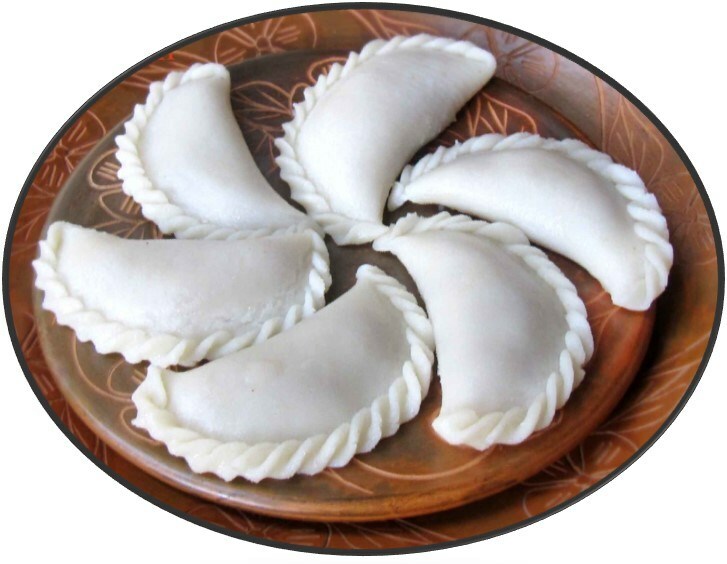 A quintessential Bengali crepee made out of date palm jaggery, rice flour and semolina, stuffed with a filling of coconut and/or sweetened condensed milk. Ingredients: Rice flour (best to use gobindobhog but not necessary), milk, flour, semolina, nolen gur (date palm jaggery), desiccated coconut and/or sweetened condensed milk (recipe below). Recipe: Sweetened condensed milk: easily available in sweet shops -“ khowa kheer” or you can make it yourself- just boil milk mixed with date palm jaggery until it thickens remember to stir continuously and add a pinch of salt (this prevents the milk from spliting). If you are using ready-made “khowa kheer” just add a bit of date palm jaggery (nolen gur) and mix in. Add a bit if milk if necessary. Coconut stuffing: Mix desiccated cocunut with nolen gur almost in equal quantities (for one cup of coconut add 3/4 cup of jaggery). Add the mix to a pan or wok and stir until the mix leaves the side of the wok. Batter: To make the batter mix in rice flour, semolina and flour in equal quantities add in milk and nolen gur till you get a smooth consistency. Now heat a non-stick tawa/pan, to this add a bit of vegetable oil or brush a bit of ghee and pour a small amount of batter (about a ladle full) onto the pan. Spread it out in a round shape. Now add the coconut mix or the condensed milk filling- you can also use equal quantities of both. Carefully fold the edges from both sides and remove from heat. Remember to cook this on a low flame/heat. Chocolate: If music be the food of love, play on…thus spake Shakespeare…Oops! he got it all wrong! The food of love, the flavour of the month…yummy chocolates, it is…you bet…With St. Valentine blessing the cupid-struck and the starry-eyed, it is surely these magic bars, that floors one and all, the lover and the loved one. Be it the tall, dark and handsome type or the ones without a speck of black, the milky white tribe or the beauties in brown, it is chocolate all the way. Trivia: Chocolate is actually a vegetable! The Cacao tree on which the Cacao bean grows, is a vegetable. Ingredients: Dark chocolate, Almonds, Honey, heart shaped baking tray. Recipe: At first melt some dark chocolate in a sauce pan over medium heat. Then Pour the melted chocolate into a heart shaped baking tray. Now place a few almonds in with each of the dark chocolate hearts and finally drizzle some honey over the heart shaped chocolates. Ingredients: 2 cup (300g/ 10oz) roasted hazelnuts, ½ Cup (2 oz. / 60g) cocoa powder, 2 teaspoon of vanilla extract, ½ teaspoon salt, ½ cup (5oz/150g) maple syrup (agave or honey), 1 cup (6oz/180g) Chocolate, melted, 1 cup (150g/5oz) roughly chopped hazelnuts (to garnish). Recipe: Add the hazelnuts into a food processor (keep aside 40-45 hazelnuts for the centre) and blend into a fine paste like consistency. It takes 2-3 minutes. Then add cocoa powder, vanilla extract, salt and maple syrup and blend until the ingredients start to stick together, just 20 seconds. You need the mix to be sticky and not dry. if it is not shapable then continue to blend. Then roll into small balls, inserting a hazelnut into the centre. Once they are all rolled, place in the fridge for an hour minimum to set them. Once set, dip each Ferrero Rocher in the melted chocolate. Let any excess chocolate dip off. Then toss them in the chopped hazelnuts and coat them all over. Place them on a tray lined with parchment. Store in the fridge until ready to enjoy. They will stay fresh in the fridge for up to 3 days. Ingredients: 1 1/2 tbsp rum, 1 tbsp raisin (kismis), 1/2 cup chopped dark chocolate. Recipe: ombine the rum and raisin in the bowl, mix well and keep aside to soak for 3 hours. Drain and keep aside. Now put the chocolate in a microwave safe bowl and microwave on high for 1 minute and mix well. Fill the chocolate mould with the melted chocolate till ¾ full, tap it lightly. Then put 2 to 3 soaked raisins in each cavity. Fill the mould with the remaining melted chocolate, tap it lightly again and refrigerate for 30 minutes or till firm. 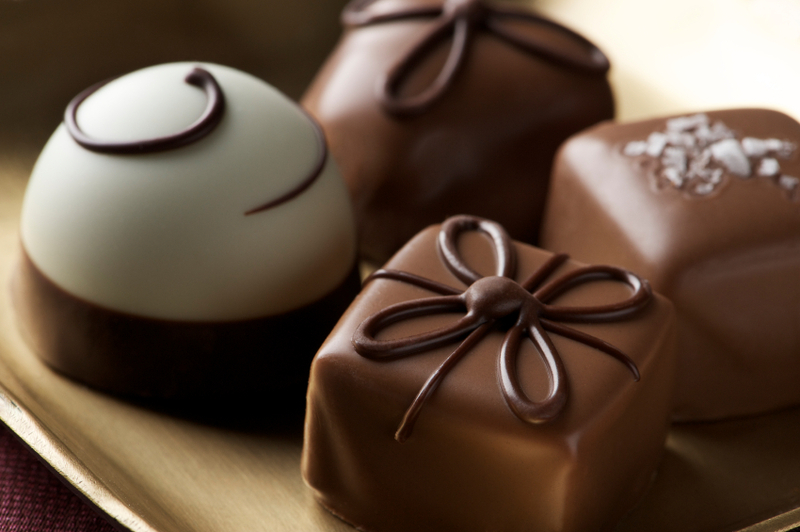 Now unmold the chocolates and serve or store in an air-tight container in a refrigerator. Ingredients: Dark chocolate chopped ½ cup, White chocolate melted ½ cup, Fresh cream 2 tablespoons, Dark chocolate cream cookies 15-20. Recipe: To prepare ganache, heat cream in a non-stick pan. Add chopped dark chocolate, mix and cook for a minute. Remove from heat and mix till chocolate melts and well incorporated. Then grind the cream cookies to make a fine mixture and transfer in a bowl. Add ganache and mix well. Now divide the mixture into equal portion, shape them into balls and transfer onto a plate. Refrigerate for 1 hour. Line a tray with a silicon mat and dip each ball in melted white chocolate and place on the silicon mat. Keep aside till set. Now serve immediately. Ingredients: 8 ounces raw cacao butter, 1/2 cup Swerve or powdered erythritol, 1/4 cup vanilla protein powder use Jay Robb which is sweetened with stevia, 2 teaspoons vanilla extract, 1/4 teaspoon salt, 1 1/2 teaspoon vanilla liquid stevia, Optional: dried cranberries chopped nuts. Recipe: Melt the cacao butter over low heat in a saucepan until completed melted. Remove from heat and whisk in swerve until combined. Let cool about 15 minutes then add mixture into a blender. Add in the rest of the ingredients and blend until smooth. Pour into chocolate bar molds and add optional ingredients if desired. Refrigerate until hardened. Ingredients: 1/2 cup + 1 tbsp cacao or cocoa powder. 4 tbsp virgin coconut oil, melted. vanilla stevia drops to taste (If you'd prefer to use a liquid sweetener, such as agave or pure maple syrup, use this ratio instead: 1/4 cup cocoa powder, 1/4 cup coconut oil, 3 tbsp of your liquid sweetener.). optional extracts, cocoa nibs, or other add-ins. optional 1 extra tbsp oil or water, if it needs to be thinner. Recipe: Combine coconut oil with the liquid sweetener or stevia drops. Stir, then add the cacao powder. Stir stir stir! Stir until it gets thick. Pour into any flat container (or candy molds or smush between layers of wax paper or in ziploc bags). Freeze until solid, and store in the freezer. Once hardened, you can also opt to melt the bars again for chocolate sauce. Or chop them up for healthy 100% sugar-free chocolate chips! If you use the stevia option, these bars are sugar-free. Gorom jilipi isn’t just a hot favourite during the festival of colours, but also savoured as a delicious constituent of your Sunday breakfast. Watching them swimming in hot oil followed by a dive in sugar syrup is truly a visual treat that enhances one’s cravings for more! Trivia: Kolkata’s best crunchy jilipi made of asli ghee and real kesar is sold just underneath Kaali Godaam where the Birla empire started in early 1900s. Ingredients: Water - as required. Sugar - 1 cup. Saffron colour - pinch. Oil - 1 tablespoon. Curd - 1 cup. Cornflour - 30 grams. Maida - 100 grams. Lemon juice - 1 tea spoon. Oil - as required. Recipe: Take a bowl, add curd, and mix it well. Then add Maida and cornflour to the mixture and mix them well to avoid lumps. Add food colour and hot oil and mix it again. The batter made should be kept as such for 24 hours to ferment. Take a bowl and add sugar to it, add water to make sugar syrup of 1 thread consistency. Add a few drops of lime juice in the syrup and keep it aside. The few drops of lemon juice will prevent crystallization. Heat up the oil to fry the jalebi, pour the batter through a ziplog bag with a hole so that it can pass through. Press the batter in the hot oil and fry it at a very low flame till it gets a golden brown colour. Remove from the oil and drain the oil, dip immediately in the sugar syrup for a minute and put it in a plate to serve. Ingredients: 3 ½ Tbsp Warm Water. 1 Tsp Sugar. ½ Tsp Active Dry Yeast. 1 Cup Flour. ¼ Tsp Saffron Powder. 1 Tbsp Besan. 1 Tbsp Oil + for frying. Water as required. Kesari Saffron Syrup,, to soak. Saffron Strands, for garnish. Recipe: Add water, sugar and yeast to a small bowl. Mix well, cover it and keep aside to froth for 15 minutes. After 15 minutes, add flour, saffron powder, besan, 1 tbsp oil and yeast mixed in a large bowl. Whisk well, add water as required and whisk again until smooth and a batter like consistency is achieved. Add more water if the batter is too thick or add a little flour if too thin. In a deep pan, add 2 inches oil and heat over medium-high heat. While the oil is heating, add some of the jalebi mix into a piping bag and cut just a little from the bottom. 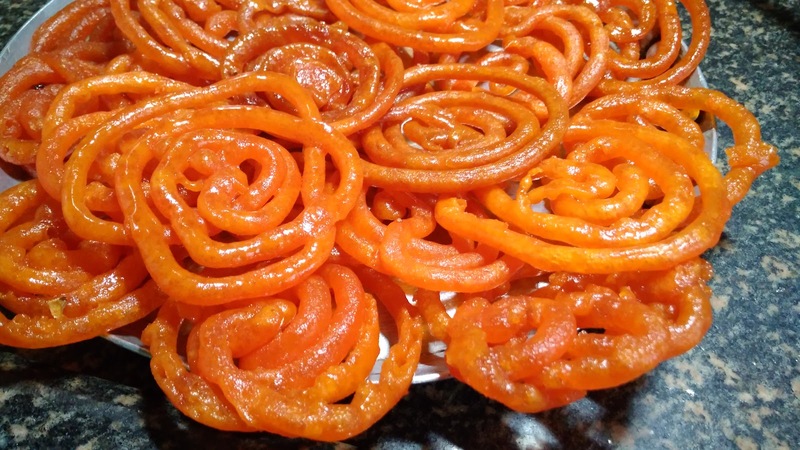 Once the oil is hot, pipe the jalebi into the hot oil in a circular motion. Fry for 30-40 seconds per side or until it gets a golden brown brown and serve it on a plate. Repeat with all the jalebi mix. Once cooked, transfer to a large bowl, pour saffron syrup on the top and soak for 2-3 minutes while turning gently. After 2 minutes, strain the jalebi, arrange on a serving platter, garnish with saffron strands and serve hot and crispy. Ingredients for malpua: 1 cup maida / plain flour / all purpose flour. ½ cup rava / semolina / bombay rava / sooji. ¼ cup sugar. ½ tsp fennel / saunf powdered. ¼ tsp cardamom powder / elachi powder. ½ cup milk / rabri. water as required to prepare batter. oil for deep frying. rabri for serving. dry fruits for garnishing. for sugar syrup:1 cup sugar. ½ cup water. ¼ tsp cardamom powder / elachi powder. few threads saffron. Recipe: Take Maida, rava and sugar in a large mixing bowl. Add fennel powder and cardamom powder. Further add milk or rabri. Mix well making sure there are no lumps in the batter. Add water as required and mix well. Make sure the batter is of smooth poring consistency. Further whisk the batter for atleast 5 minutes. Cover and keep the batter for 30 minutes. Pour the batter into hot oil / ghee. Once the malpua starts to float, splash oil over malpuas and also press gently with the help of perforated spoon. The malpuas will puff up like poori. Now fry both sides till they turn golden brown and drain the malpuas onto the kitchen towel to remove excess oil. Now soak the malpuas into hot sugar syrup, keep for 10 minutes making sure both the sides of malpua are soaked well. Finally, serve the malpuas hot with rabri and garnished with a few nuts. Ingredients: 4 cups milk of your choice (I used homemade almond milk). ¼ cup coconut sugar. 15 almonds, soaked and peeled. 2 tablespoons cantaloupe kernels (remove outer shell) or buy Char Magaz (cantaloupekernels). 2 tablespoons white poppy seeds. 5 black peppercorns. 3 cardamom pods, remove seeds from pod. ¼ teaspoon fennel seeds. ¼ teaspoon rose water. crushed pistachios, garnish. Recipe: Soak almonds, cantaloupe kernels and poppy seeds overnight. Drain the nuts/seeds and peel off almond skins. Grind the peppercorns, cardamom and fennel seeds in a spice or coffee grinder, and keep it aside. In a blender, add the peeled almonds, poppy seeds, cantaloupe kernels, coconut sugar, rosewater, spices and 1 cup almond milk to a blender and blend until the mixture is very smooth. Add the rest of the almond milk and blend it well. Strain the mixture in a double lined cheesecloth and refrigerate until nice and cold – garnish it with crushed pistachios. For the melon seeds – wash and dry cantaloupe seeds. After a day or two, break the seeds open with tweezers/fingers and use the kernels in this thandai recipe. Alternatively, you can buy shelled seeds from the market and use them in the recipe. Ingredients: Full Cream Milk 1 1/2 litres. Almonds blanched and peeled 25. Cashewnuts soaked 20. Pistachios blanched and peeled 30. Melon seeds (magaz) soaked 3 tablespoons. Poppy seeds (khuskhus/posto) soaked 3 tablespoons. Saffron (kesar) a few strands. Sugar 1 1/2 cups. Green cardamoms 8-10. Rose petals 20-25. Cinnamon 1 inch stick. Black peppercorns 8-10. Recipe: Grind almonds, cashewnuts, pistachios, melon seeds and poppy seeds together with a little milk to make a fine paste. Boil the milk in a pan. Add saffron and mix. When the milk begins to boil, add sugar and simmer till the sugar melts. Grind green cardamoms, dried rose petals, cinnamon and black peppercorns to make a fine powder. Add the paste to the milk and mix well. Simmer for three to four minutes. Add the powdered masala to the milk and mix well. Chill the milk and serve. The big fat Bengali Naboborsho feast begins right from the breakfast with luchi, sada torkari made of small cubed potatoes and black cumin seeds followed by sweet thick payesh. During lunch simplicity gives way to a real variety-platter. Items will of course depend on one’s taste, but the essentials include steaming rice, a slice of crisply fried eggplant, crisp thin juliennes of fried potato, golden fried halved patol, golden mug dal with a dash of ghee, a runny curry of kochi panther jhol, sorshe ilish, prawn malai-curry, and for dessert sandesh and mishti doi. Trivia: Rabindranath Tagore’s family members were great experimenters in traditional Bengali cuisine. This has resulted in a special genre of cooking that has become famous as Thakurbarir Ranna. Recipe: Wash and cut the bitter gourd into thin roundels. Heat two tablespoons of oil in a pan and fry bitter gourd slices lightly. Drain and keep aside. Make a thick paste of poppy seeds, mustard seeds and ginger. Heat the remaining oil in a kadai. Add panch phoron and bay leaves. When the seeds start to crackle, add the chopped vegetables and stir lightly. Add the ground spices and stir for five to seven minutes. Add two cups of water and cover. Cook with the flame on medium heat, stirring occasionally till vegetables are almost cooked. Add the fried bitter gourd, salt and sugar. Stir and add a tablespoon of ghee. Cook for another two minutes till gravy is neither too thick nor too dry. Serve hot. Recipe: Soak the poppy seeds in a bowl of hot water for 2 hours. Make sure the water covers all of the poppy seeds. Using 4 tablespoons of the soaking liquid add the poppy seeds to a blender and grind it to a paste. Put it aside. Heat oil in a heavy bottom sauce-pan and keep heating the oil over a medium flame. Add the nigella seeds and green chillies. Fry for 7-8 seconds and add the peeled potatoes. Mix well and fry for 5 minutes. Add the turmeric powder and stir well. Put the lid on and continue frying for 5 more minutes. Stir and add the poppy seed paste making sure it coats all of the potato pieces. Add the water and season to taste. Bring it to the boiling point and simmer with the lid on for 15 minutes. Stir halfway through cooking. Add a pinch of sugar and a few more chillies (if you like it spicy) and simmer for 2 minutes. Add a little more water if it gets too dry. Serve with a bowl of dal and rice/ dal bhaat. Recipe: Heat mustard oil in a non-stick pan till smokes arise. Squeeze the onions and discard excess water. To the oil remaining in the pan, add cloves and onions and sauté till browned. Add ginger and garlic and continue to sauté till fragrant. Add 1½ cup of water and cumin powder and mix well. Add salt and mix. Add fried fish and coriander leaves and cook on low heat for 2-3 minutes. Recipe: For marinating the mutton, mix together garlic, ginger and onions. Grind them together in a mixer to make a smooth paste. Wash and clean the mutton. Add to it the ingredients for the marinade - yogurt, turmeric powder, coriander powder, red pepper powder, some mustard oil, and half of the ginger/garlic/onion paste. Let the mixture stay for about 2 hours. Ensure that you prick the mutton with a fork so that it absorbs all the flavours. Heat 2 tablespoon mustard oil in a wok. Fry the potatoes till they turn golden brown. Keep them aside. Now, for cooking the mutton, heat the remaining mustard oil in another wok. Add some turmeric to it. Then, temper it with the black pepper, cinnamon stick, bay leaves, cloves, and cardamom. Also, add sugar to it. The sugar gives a nice red colour to the gravy and also contributes to the subtle sweetness of the spicy gravy. Add the remaining onion paste along with meat masala and fry for about 5 minutes. You'll notice the oil separating from the mixture. Now add the marinated mutton. Cook at a low flame for about half an hour. Add 2 cups of water (depending on quantity of gravy to be prepared) and cover the wok. Let the mutton cook for at least an hour till the mutton becomes soft and succulent. Ensure that the flame is at its lowest for the entire duration. Now, add the fried potatoes and garam masala, and stir it well. Let it cool for some time and then sprinkle freshly chopped coriander leaves. Recipe: Peel and cut lau into very small pieces (4 cm squares). Add salt to them and keep aside. Peel shrimp, wash thoroughly, rub salt and turmeric and keep aside. Heat oil in a pan. Add cumin seeds, whole dry red chili, and a bay leaf. Let it splutter. Add shrimp and stir for couple of minutes. Now add lau and stir well. Put a cover on and let it cook on low flame. Take the cover off occasionally and stir. If the lau is fresh it will release water. The lau will soften gradually. No need to add water as the lau will cook in its own juice. Add turmeric powder, red chilli powder, cumin powder, coriander powder. Stir and cover. At this point if you don’t see enough water released from lau then add ¼ cup of water. Keep the lau covered. Let it be cooked fully. Adjust salt and take it off the heat. Serve with rice. Recipe: To begin making the Mochar Ghonto recipe, we will first clean the banana blossom/plantain flower. Oil your hands and start working with the banana flowers. Firstly, peel the purple layers and remove the florets. In each floret remove the longest string with a round head called the 'stamen' and the translucent thin cover. Now chop the florets finely and soak them in diluted buttermilk or plain water. Add turmeric and salt to the buttermilk and allow it to soak overnight (refrigerated) or at least for 30 minutes. To cook the banana blossom/plantain flower, drain the water from the florets. Cook them in a pressure cooker with 1/2 cup water upto 2 whistles. Once cooled, gently mash using the back of a ladle. The next step is to make the curry. Heat a heavy bottomed pan with mustard oil over low flame. When the oil starts to smoke, add bay leaves and cumin seeds. Now add the grated ginger and garlic and saute for 30 seconds. Stir the cubed potatoes, chilli powder, salt and 1/4 cup water. Let the potatoes cook for 5 to 7 minutes. Once the potatoes are cooked and dry, add the cooked banana blossom, sugar and mix well. Cook it covered for 2 minutes. Add salt and add the ground coconut-chilli mixture. Immediately add the garam masala powder, stir well over medium flame and switch off. Garnish with a teaspoon of ghee. Mochar Ghonto is a dry curry recipe and is often served along with steaming hot rice and ghee. Recipe: Marinate the fish with turmeric powder and salt. Let it stand for half an hour. Heat oil in wok till it smokes and simmers. Fry one fish at a time, till they turn deep golden on both sides. Take them out from the wok and keep aside. Now in the same oil add 2 green chilies, bay leaf , cinnamon, cloves, cardamom pods and lightly fry them. In the meanwhile make a paste of cumin, coriander, turmeric, red chilli powder, tomato puree and keep it aside. When the green chilies and whole spices are lightly fried add the ginger, garlic paste and the onion juice and fry for 30 seconds. After 30 seconds, add the masala paste made earlier, tomato puree, some salt & sugar and fry the mixture till oil separates from the masala. When oil starts separating from masala, add the yogurt and fry for 1 minute on low heat. After frying the masala add 1/3 cup of water to it and the fried fish and bring the gravy to boiling point for 5-7 minutes. After boiling the gravy, turn off the stove and place the Tel Koi in a serving bowl and garnish with cilantro , green chilies and serve with steamed rice. Remember this dish has a oil based gravy. So it will be very spicy and oily. The name itself evokes such flavours that one starts feeling hungry at the very mention of it. Scooped up from the unmistakable gigantic brass handi, it comes in numerous forms, varying according to ingredients and cooking methods. The version that arrived in Bengal for the first time was Awadhi Dum Biriyani, when Nawab Wajid Ali Shah was exiled to this city in 1856. After a whole day of fasting, when it’s time for Iftar, a plate of Biriyani is just what one wants to lift one’s spirit and body. Trivia: Kolkata’s unique contribution to the millennia old culinary experimentation, which resulted in the making of the dish, is the addition of the humble potato. Other ingredients: 4 thinly sliced onions, 2 chopped tomatoes, 1/4 th cup of warm milk, Ghee, Saffron strands, Oil, Rose water, Kewra essence, 4 green chilies. 2. Allow the mutton to marinate for 3 hours. Making fried onions or Barista 1. Slice 2 onions very thinly. Separate the slices. 2. In a pan or kadai, add oil and fry the onion slices till they are brown. 3. Take care in not burning them. Fry in small batches. Do not put all the slices at a time, that will lead to lumpy messy onions. 4. Make sure all the onion slices frying are dipped in oil, if needed add more oil. Keep stirring continuously but gently for a browner color. 5. Take the fried onions out with a slotted spoon or ladle. 6. Keep them on a paper-towel lined plate. This crispy brown fried onion slices are called Barista. Cooking the mutton: 1. Heat ghee in a thick-bottomed pan. 2. Add remaining sliced onions and green chilies. Cook, stirring continuously, till onions are light golden-brown. 3. Add ginger paste and garlic paste and mix well. 4. Add marinated mutton and cook on high heat for seven to eight minutes. 5. Add coriander powder, cumin powder and red chili powder. Mix thoroughly. 6. Stir in three cups of water, bring it to a boil, reduce heat and cook covered till mutton is almost cooked. 7. Add tomatoes, salt, garam masala powder and fresh coriander leaves. 8. Cook for 15 minutes on medium heat, stirring occasionally. The ghee would be separated from the spices and there should not be any watery gravy to the meat. Preparing the rice: 1. Use only good quality long grain Basmati rice. Soak the rice for 20 minutes in water. Wash well till the water runs clear. Drain all the water. 2. In a small piece of cloth take cardamom, cinnamon, cloves, javitri, jaiphal, black peppercorn, shahi jeera, star anise and tie a knot to make a bag (potli). 3. Bring 750 ml water to boil, add rice, bay leaf, salt and potli, cover and cook till rice is cooked 4. Drain the water & remove the whole masala potli. Preparing the saffron-milk: 1. Take 1/4th cup warm milk in a cup and dissolve saffron strands in the milk. 2. Cover and wait for 20 minutes. Add rose water and kewra essence in the milk. Mix well and cover. Keep aside. Layering the biryani: 1. Take a large heavy bottom pan with tight fitting lid. 2. Add 2 tablespoons of ghee to the pan. Melt the ghee on low heat. Turn and rotate the pan carefully so the ghee can coat the bottom and sides of the pan. Switch off the heat. 3. Add a layer of cooked rice, then cooked meat pieces, sprinkle saffron water, add fried onion slices and ghee. 4. Again add a layer of rice, then meat...go on like this till you are done. Top and bottom layer will be of rice. 5. Cover with chopped pudina and coriander, fried onion and slit green chillies and juice of half a lemon. 6. Put the lid on. Seal the pan with flour dough or aluminum foil, then put the lid. Keep the heat to lowest. And cook the Biryani in this 'Dum' process for 40 minutes. 7. Make sure your pan is heavy-bottomed or the rice will burn. Or you can place a flat tawa then keep the pan on that tawa. 8. After 40 minutes switch off the heat and let the biryani stand for another 10 minutes. Transfer to a serving bowl. 9. Serve with raita and salad. 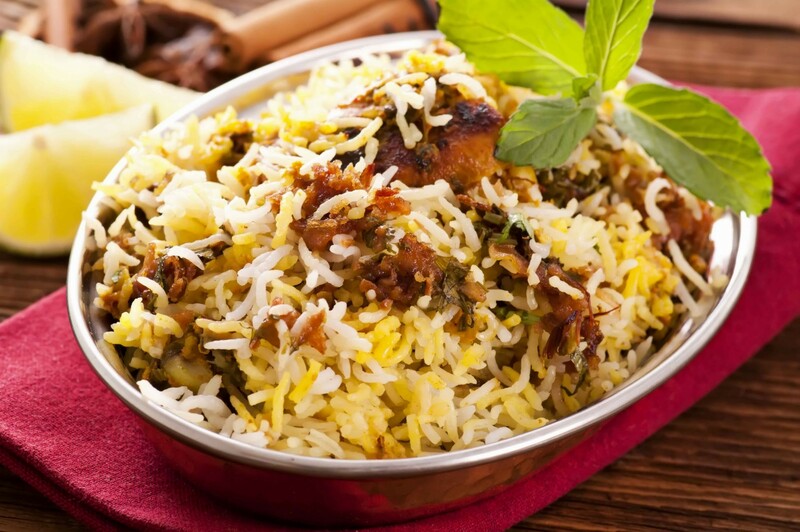 Ingredients Of Hyderabadi Biryani: 1kg Chicken, 1 tablespoon salt, 1 tablespoon ginger garlic paste, 1 tablespoon red chili paste, 1 Tablespoon green chili paste sautéed brown onions to taste, 1/2 Tablespoon cardamom powder, 3-4 sticks cinnamon, 1 Tablespoon cumin seeds, 4 cloves pinch of mace mint leaves to taste, 2 Tablespoons of lemon juice, 250 gm curd, 4 Tablespoon clarified butter, 750 gm semi cooked rice, 1 teaspoon saffron, 1/2 cup water, 1/2 cup of oil, Garnish Ingredients, boiled eggs, carrots sliced, cucumbers. How to Make Hyderabadi Biryani: 1. Clean the chicken. Then in a pan, add meat, salt, ginger garlic paste, red chili powder, green chili paste, sautéed brown onions, cardamom powder, cinnamon, cumin seeds, cloves, mace, mint leaves and lemon juice. Mix it well. 2. Add curd, clarified butter, semi cooked rice, saffron, water and oil and mix it well. 3. Now apply sticky dough on the sides of the pan. 4. Cover with lid to seal it and cook for about 25 minutes. 5. Hyderabadi Biryani is ready to eat. Garnish it with boiled eggs, sliced carrots, cucumbers and serve hot. How to Make Vegetable Biryani: 1. Heat oil and add cumin seeds. 2. Sauté and add the onions, garlic-ginger paste. Sauté till it’s brown in colour. 3. Add vegetables, stir fry over low heat till half done. 4. Add coriander powder, garam masala, haldi, salt, chili powder and green chilies. 5. Cook, covered for about 5 minutes and mix in the lemon juice and half the coriander. 6. The water should be absorbed by now. Remove half the vegetables and layer with half the rice. 7. Cover with the rest of the vegetable mixture and the rice again. 8. Leave over low heat, covered for 10 minutes or so and serve garnished with the coriander. How to make Egg Biryani: For preparing this easy lunch/dinner recipe, wash and soak rice for about 30 minutes. Soak the saffron in luke warm milk. Heat oil in a pan over moderate flame. Add sliced onions and fry until golden brown. Once done, keep them aside in a plate. For preparing eggs, boil the eggs and pierce them randomly with a fork. Lightly fry the eggs in the remaining oil. Remove and keep aside. Take oil in a pan, add the whole spices and cook till they begin to splutter. Add ginger and garlic paste and sauté until the raw smell goes off Add chili powder and garam masala powder. Sauté just for few seconds. Now, add yoghurt, salt and mint leaves. Add eggs, along with ¾ of the fried onions, stir well and cook over medium-low heat until the gravy thickens. Remove it from the stove and set aside. For preparing the biryani, bring 6 cups of water to a boil and add the spices and salt. Allow it to simmer for 4 minutes. Add the rice and drain it when cooked al dente. Reserve 1 cup of the water. Add half of the rice to the pot, add a layer of eggs along with masala. Add a layer again with the remaining rice, sprinkle the mint leaves and the rest of the fried onions. Also pour the saffron soaked milk. Sprinkle the reserved water and the kewra water. Seal the pot with a tight lid or an aluminum foil. Place on high heat for about 5 minutes. Place the pot over a girdle on low heat for 10 minutes. Switch off the stove and allow it to rest for another 10 minutes. Open the biryani and serve hot with a flavorful raita and chutney. Recipe: Boil water in a heavy pan. Add salt, black cumin and bay leaves. When the spices give of an aroma add rice and cook until half done. Strain in a colander. To make the meat balls in a food processor chop together green chilies, mince, red chili powder onion, ginger garlic paste, turmeric, all spice powder and salt. Shape the mixture into small round balls and steam them. Then put silver paper on half of the meatballs. To prepare the masala heat oil in a pan adds white cumin and whole garam masala. When the spices begin to sizzle add the brown onions. Fry well. Add ginger garlic paste and fry until the oil floats on top. Then add yogurt, green chilies, garam masala powder and white cumin. Fry for 3-4 minutes. Add plums and chopped tomatoes. Cook for 5-6 minutes. The masala is ready. For assembling take a deep pan add clarified butter and oil. Spread a layer of half of the rice. Spread another layer of chopped coriander, chopped mint leaves and meat balls without the silver paper. Add a final layer of rice. Sprinkle the remaining masala, chopped coriander, chopped mint leaves and green chilies. Sprinkle yellow food color on top followed by the remaining meatballs and warm clarified butter. Cover and simmer for 5 minutes. The humble and much loved daler bora is a very interesting concept. 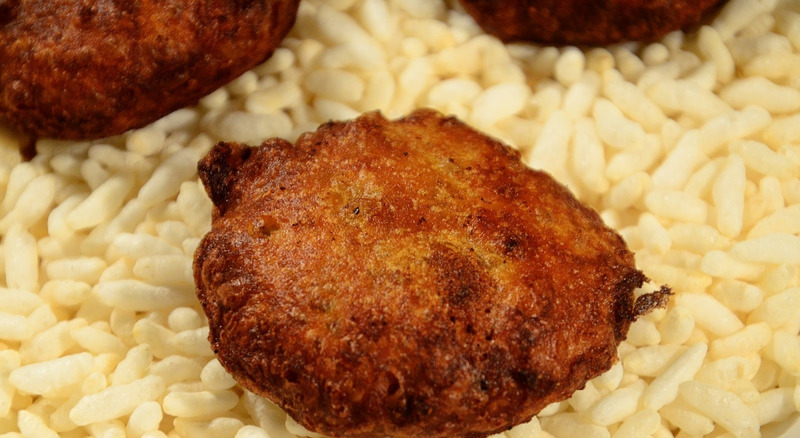 They are small lentil fritters that we Bengalis often enjoy with rice and dal sometimes as a part of a pure vegetarian meal. Essentially, a typical part of the Bengali meal is to pair something fried with the dal. This can be crisply fried pieces of fish or for a vegetarian option the daler bora. Veg pakora is a similar fried snack popular in Kolkata. It is usually named after the name of the vegetable that is deep-fried is suffixed with Bhaji. For instance, potato bhaji is sliced potato wrapped in batter and deep-fried. Pakoda is taken to mean a mix of finely chopped onions, green chilis, and spices mixed in gram flour. This is then rolled into small balls or sprinkled straight in hot oil and deep-fried. Pakodas are very crisp on the outside and medium soft to crisp inside. Ingredients Of the Daler Bora: Matar Dal (split peas) - 1/2 cup, Red Masoor Dal - 1/2 cup, Ginger - 1 piece, peeled and chopped, Green chilli – 3 to 4 pieces, Water - 1/2 cup, Roasted cumin powder - 1 tsp, Salt to taste, Onion - finely chopped, Green chilli - finely chopped, Coriander leaves - optional. Directions : Soak Matar Dal & 1/2 cup of red Masoor Dal in water for half an hour. For only Masoor Dal er Bora, use 1 cup of Red Lentils/Red Masoor dal. In the blender add the soaked lentils, ginger, green chilli and water to make a smooth paste. Add roasted cumin powder, salt, onion, green chilli and coriander leaves (optional). Beat the lentil paste with a fork till everything is well mixed up. In a kadahi, heat oil for deep frying. When oil is hot, scoop the paste with a tablespoon and drop it in the bubbling hot oil. Fry till the lentil fritters are brown and crunchy. 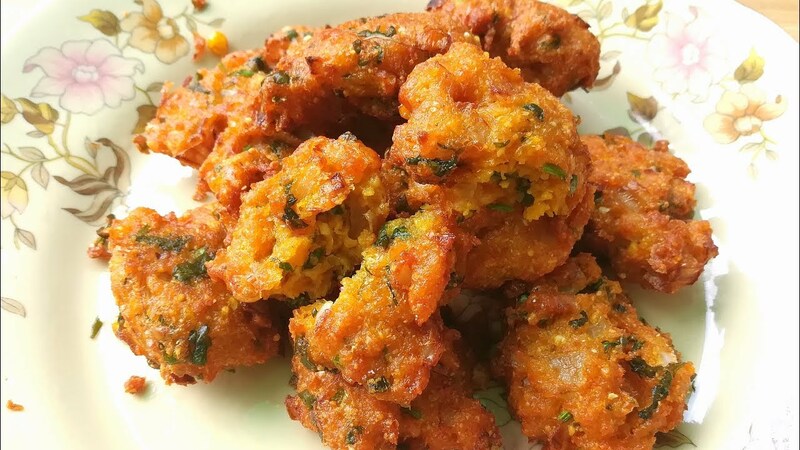 Ingredients Of Veg Pakora: 1/2 cup finely chopped cabbage, 1/4 cup finely chopped carrot, 1/4 cup finely chopped French beans, 1/4 cup finely chopped onions, 1/4 cup finely chopped coriander (dhania), 1/4 cup finely chopped capsicum, 2 tsp finely chopped green chillies, 1/2 tsp chilli powder, 1/4 tsp asafoetida (hing), 1/4 tsp turmeric powder (haldi), A pinch of baking soda, Salt to taste, 3/4 cup besan (Bengal gram flour), 2 tbsp rice flour (chawal ka atta), Oil for deep-frying. Directions: Combine all the ingredients, except the besan and rice flour, in a deep bowl and mix well. Add the besan, rice flour and approx. ½ cup of water and mix well. Heat the oil in a deep non-stick pan, drop a spoonful of the mixture using your fingers and deep fry a few pakoras at a time on a medium flame till they turn golden brown in colour on all the sides. Drain excess oil on absorbent paper. Serve immediately with green chutney and tomato ketchup. Kolkata as the capital city of West Bengal breeds nostalgia, and once you are there, you never feel like leaving the city. Simply the reasons are-the easy city life, the warmth of people and last but not the least-cheap and finger-licking Bengali street food. Telebhaja is Kolkata’s fried goodness. It refers to pakodas deep fried in oil. Here the monsoon evenings are incomplete without the smoking hot delights that are made with besan batter, eggplant, onion, and potato, and are best served with a hot cup of tea. Ingredients Of the Chop/Patties: Potato (4 medium + 1 small), Onion (1 medium, chopped fine), 3 Garlic cloves, chopped, Ginger (1 tbsp), minced, Green Chilli - 4 to 5, chopped fine (According to taste) Fresh Coriander leaves – 1 to 2 tbsp, chopped, Roasted Cumin Powder - 1 tsp, Red Chilli Powder - According to taste, Salt - According to taste, Mustard Oil - A few drops (Optional). Ingredients Of the Batter: Besan/Chickpea flour - 1 cup, Rice flour - 1 tbsp or Poppy seeds - 1 tsp, Baking powder - 1/4 tsp, Salt - According to taste, Water - 3/4 cup. Directions : Boil the potatoes, peel the skin and mash them. Use your fingers or a masher. Heat about 1-2 tsp of oil in a frying pan and add the chopped garlic, ginger, green chillies and onion. Fry until the onion turns pinkish brown. Add the roasted cumin powder and red chilli powder and saute for a minute. Add the mashed potatoes. Add salt and mix the masala well with the potatoes. Do not fry or cook the potato any further. Add a few drops of mustard oil to the potatoes if you want. Let this cool. Make small balls of the mashed potatoes which are now spiced with the masala. Flatten them between your palms and place them on a lightly greased surface. Make a batter with the ingredients. Add the water gradually as you don’t want the batter to be runny. The batter should be tight as it has to form a coating on the potato patties. Heat oil afresh in frying pan. The patties would be deep fried so add enough oil. Dip the patties in the batter, so that the batter uniformly coats the patties. Gently release the dipped patties in hot oil and let it sizzle. Heat on medium flame. Fry till both sides are golden brown. Remove with a spoon/chalni which has slots/holes so that the excess oil drains out. Drain excess oil by placing the fried patties on a kitchen towel. Sprinkle some Chaat Masala or kala namak/black rock salt (beet noon) on the patties while serving. Ingredients Of Beguni: Brinjal - 2, Salt to taste, Sugar - 1 teaspoon, Besan flour - 2 cups, Red chilli powder - 1/2 teaspoon, Turmeric powder - A pinch, Asafoetida (hing) - A pinch, Ginger powder (optional) - A pinch, Oil - 2 cups, Cumin seeds (optional) – 3 to 4 teaspoons, Chaat masala - 1 teaspoon. Directions: Cut brinjals either into longitudinal thin slices or thin rounds. Add salt to taste. You may add a pinch of sugar. Set aside. Make a batter of 2 cups of besan. Start to add water little at a time to make a smooth and thick batter. Use as much as you need. Add salt, red chili powder, pinch of turmeric powder and a pinch of hing. Add some ginger powder if you have some. Heat oil in a deep fryer. Coat the brinjal slices in batter. Let the oil be really hot. Slowly release the coated brinjal in oil. Fry till each side is golden brown. Place it on a towel to let the excess oil be soaked. Sprinkle some chaat masala on top for the street food kind of flavour. Also you may sprinkle some dry roasted jeera masala. To make jeera masala, take a few teaspoons of cumin seeds and roast them on stove top. Grind it in blender and sprinkle it on the beguni before serving. Ingredients Of Phuluri: 1 medium size cauliflower, 1 cup gram flour/ plain flour, 1 egg, 3 tablespoon rice flour, ½ tablespoon chilli powder, 1 tablespoon chaat masala, ½ teaspoon turmeric powder, 1/3 teaspoon bicarbonate of soda/ baking soda, ½ teaspoon black salt(optional), 1-2 green chillies (finely chopped), 1 tablespoon onion (finely chopped), Salt to taste, Oil for deep fry. How to Make Phuluri: Cut the cauliflower into florets and wash it. Place it in a strain and keep aside. Mix all dry ingredients (flour, rice flour, chilli powder, turmeric powder, chaat masala, soda, black salt and 1 teaspoon salt) together and add 1 and ¾ cup water. Make smooth batter. Add egg, onion, green chilli and mix well. Heat pan with oil on medium high and when oil is ready, dip cauliflower florets in batter and fry it till it becomes golden brown. Serve Phuluri hot. The king of fruits is a perfect antidote to the summer of Kolkata. The Kohitur mango, arguably the most prized variety among the king of fruits that was ‘created’ during the reign of nawab Siraj-ud-Daulah strictly for royals only and now sells for up to ₹1,500 a piece. The precious mango, so delicate that each piece has to be carefully plucked by hand and swathed in cotton, was developed in the late 18th century by the last nawab of Bengal. The mango was out of bounds for commoners, with only royal orchards permitted to grow it, and only royals allowed to relish it. Still out of reach for most, except for modern-day royals who have the means to spend, the West Bengal government is trying to save and popularise the Murshidabad nawab’s favourite fruit all over the world and get a geographical indication (GI) tag. Ingredients Of Mango Cheese Cake: 300 gms of cream cheese, 50 gms of vanilla biscuits, 20 gms of butter, 90 gms of fresh cream, 1 egg, 90 gms of custard sugar, 10 gms of cornflower, juice of 1 lemon, 100 ml of mango pulp, 2 ml of vanilla essence. Recipe : Crush the vanilla biscuits. Add sugar and butter to it. Prepare cake rings with this biscuit mixture. Mix cornflower, cream cheese and sugar in a separate bowl. Add the egg, lemon juice, mango pulp and stir well. Now take different moulds, put all the ingredients and bake for 40-45 min at 150 degrees. Set to cool. Garnish with mango slices and serve. Ingredients Of Mango Lassi: 1 cup curd, ½ cup milk, 1 cup mango (cut to small pieces), 4 tsp honey/sugar, a pinch of cardamom powder, ice cubes. 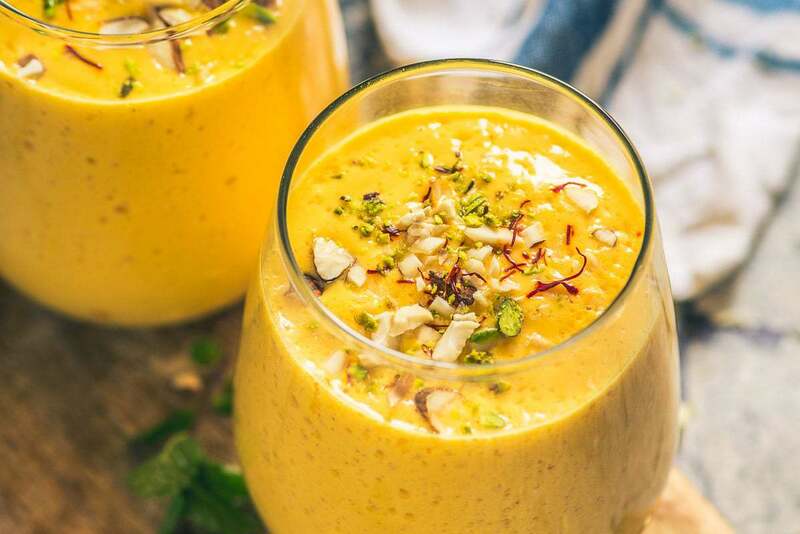 Recipe : Blend the mango, curd, milk, honey/sugar, cardamom powder and ice and set aside. Add a pinch of cardamom powder and ice cubes to serve. Or you can refrigerate it before serving this refreshing summer drink. Kolkata, the cultural capital of India, is primarily known for its vibrant culture and food. The city's din never sees a break nor does foodie's palate. 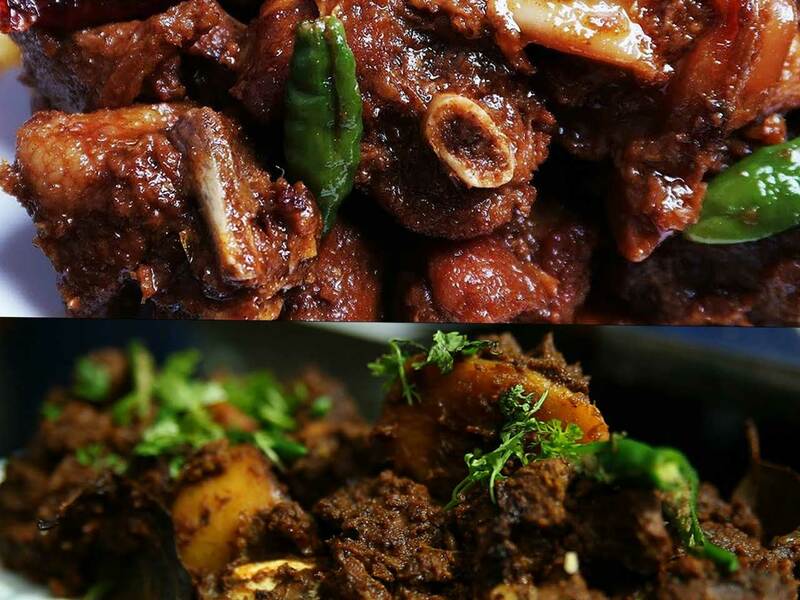 The options are myriad but not matter what cuisine you choose, the essence of Bengal would be there. You can never get enough of the traditional fare served here but if you feel like taking a break, try some of the Continental delicacies. Ingredients Of Grilled Fish with Butter Sauce: 6 fillets of Bhetki fish, 20 gms of mustard paste, 10 gms of garlic, juice of 1 lemon, salt, black pepper, 30 ml refined soybean oil, 10 gms of wheat flour, 20 gms of red green & yellow bell pepper, 20 gms of yellow & green zucchini , ¼ cup of mashed potato, 10 gms of parsley leaves. 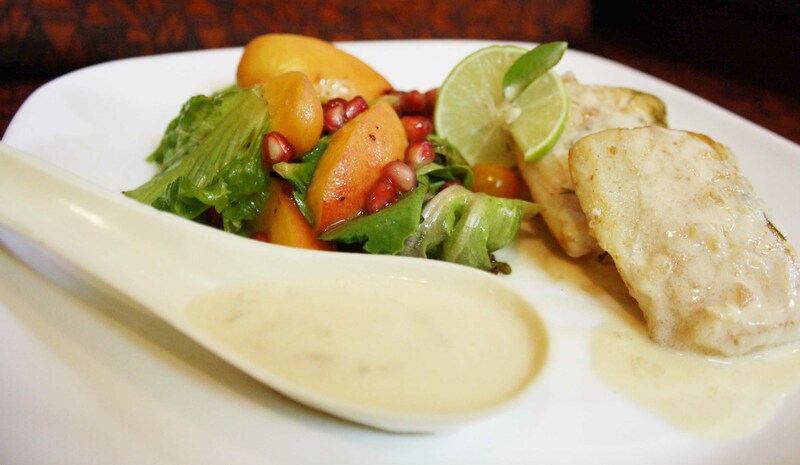 Recipe : Marinate the Bhetki fillets with refined oil, mustard paste, lemon juice, salt and black pepper. Then grill the fillets in a frying pan till it turns brown. Shift it to the oven and cook. While plating, garnish the grilled fish with mashed potato, bell pepper and zucchini. Drizzle some butter sauce and add a lemon wedge and parsley to serve. Ingredients Of Roast Chicken: 1 Whole chicken, 1 Onion, 1 Carrot, 2-3 Leeks, 1 Garlic, 3-4 Tbsp Butter, 1 Tbsp Red chili powder, 1 Tbsp Jeera powder, 1/2 Tbsp Turmeric powder, 1 Tbsp Garam masala, 2 tsp Ginger garlic chili paste, Dried fenugreek seeds, To taste Salt and Pepper, 1/2 tsp Brown sugar. Directions: Chop one onion, carrot and few leeks. In an oven tray place the chop vegetables. In a bowl, add red chilli powder, cumin powder, turmeric, garam masala. Then add ginger chilli paste, kasoori methi (fenugreek seeds), salt, red pepper and some brown sugar. Mix the mixture well. Place the chicken in the mixture and pour some butter over it. Massage the mixture well over the chicken piece. After marinating for few minutes place the chicken over the vegetable bed. Roast the chicken for 35-45 minutes at 170-180 degrees. 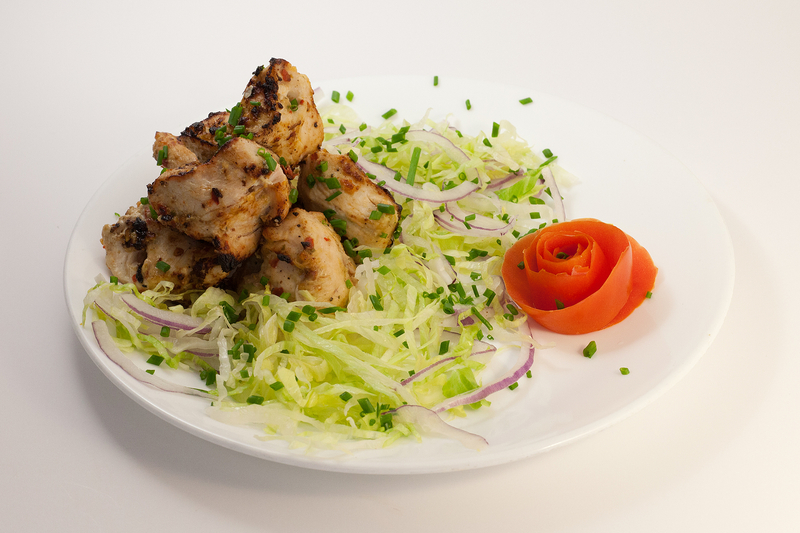 Afghani Cuisine is known for its mild spicy and lip smacking flavours. Afghani Murg Tikka is made with the goodness of cream, whisked eggs and lime juice, this appetizer tastes best when served with some spicy chutney. What's more, if you want to make it a bit more delicious as well creamy add some fresh cream and we bet your friends and family will love this dish. Unlike other Mughlai dishes, this one is slightly mild spicy, but you can garnish this dish with grated ginger, chopped green chilies and coriander leaves. The prawns themselves are delicious, but the star of the show is Bacon Wrapped Prawn. It is an easy appetizer to make and something everyone will enjoy. If you are expecting guests at home or you want to celebrate any special occasion such as kitty parties, pot luck, buffet or anniversaries, then give the Bacon wrapped Prawn recipe a shot and treat your near and dear ones with this amazing delicacy. Ingredients Of Afgani Murg Tikka: 2 eggs, 1 and ½ tea spoon ginger paste, 1 and ½ tea spoon garlic paste, 1 and ½ tea spoon fresh cream, 4 tablespoon lime juice, 6 tablespoon cashewnut paste, 6 tablespoon cheese spread, salt to taste. Directions :Wash the chicken pieces and stain the excess water until completely dry. Mix ginger paste, garlic paste, lime juice and salt in a container and keep separately. Marinate the chicken pieces in this mixture for 20 minutes. After 30 mins, mix the marinated chicken with cashewnut paste, cheese spread, fresh cream and egg batter and leave it for 10 minutes. After that, roast the chicken pieces for 5 minutes in a pre-heated ‘Tandoor’. Remember to pierce the pieces with a tooth pick before roasting to ensure that the mixture is soaked well by the chicken pieces. Once the chicken is cooked well on both sides, take it down and serve it with delicious ‘Chutneys’. Ingredients Of Bacon Wrapped Prawns: 1 lb. prawns (about 20 pieces), peeled and deveined, with tails still on, 7 pieces of thick cut bacon, cut into thirds, 4 tbsp. melted butter, 2 tbsp. maple syrup, 1 tbsp. chili powder. Directions:Preheat oven to 400°. Line a large baking sheet with aluminum foil. Wrap prawns with a third piece of bacon and secure with a toothpick. Place prawns on prepared pan. In a small bowl mix together butter, maple syrup, and chili powder. Brush prawns with about half of the butter. Bake for 15 minutes or until bacon is crisp and prawns is cooked. Brush with remaining butter and broil 3 minutes. Come to think of it, the momo has probably travelled the farthest of all foods. Momos are native to Tibet, Bhutan, Nepal, North Indian region of Ladakh, Northeast Indian regions of Sikkim, Assam, and Arunachal Pradesh. That, it is now quite at home on the streets of Kolkata, as it is comfortable at posh five-star eateries, only confirms how these stuffed dumplings(either with meat of one’s choice or assorted greens including paneer) have evolved over the years. Ingredients Of the Cake: 450 gm all purpose flour, 1 tablespoon refined oil, 1 large onion, 1 inch ginger, water as required, 300 gm boiled chicken, 1 green chilli, 1/2 teaspoon salt, 1 teaspoon soy sauce. Method : Step 1 : Chicken Momos is one such dish, which needs no introduction. However, it is pretty easy to prepare it at home without putting in much efforts. Here’s how you go about preparing it at home: To begin with rinse the veggies and chicken with lukewarm water, this will remove the adulterants. Then take a clean chopping board, chop the vegetables separately and keep them aside. Step 2 : Then take a pan or a pressure cooker and boil the chicken, with a pinch of salt and pepper. If you want to make it aromatic, you can add a small teaspoon of ginger and chili paste. If you like the flavour of garlic, you can add a small teaspoon of garlic paste. Once done, carefully shred the boiled chicken into fine pieces. Keep them aside. Step 3 : Now, take a deep mixing bowl and add refined oil in it followed by all purpose flour and salt. Mix well with enough water and knead the mixture into a smooth dough. Knead well and ensure that no lumps are formed. Take another mixing bowl and add shredded chicken followed by chopped vegetables, mix well and combine everything together. Then, add soy sauce to the chicken mix and stir well. Now take the prepared dough and roll out small balls out of it. Step 4 : Using a rolling pin, flatten the balls in a square shape and add the chicken and veggies stuffing in the center. Bring the edges close and secure them to make a momo. Repeat this step with the remaining balls. 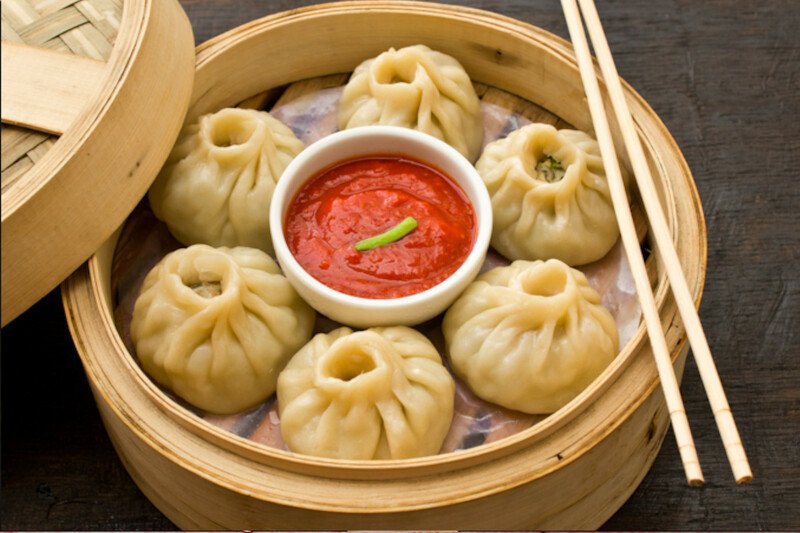 Transfer the prepared momos in a steamer and steam for 20 minutes or until they turn soft and tender. To make it more flavoursome, add the aromatic Chicken stock. Serve fresh and hot with your choice of chutney or dip. Christmas is the time to indulge. On this delightful festival food rules the celebrations. Eggless Black Forest Cake is made using whole wheat and fresh cream. This lip smacking American dessert recipe is a must try on birthday parties and anniversaries. Indulge in this cake recipe and make any occasion special. 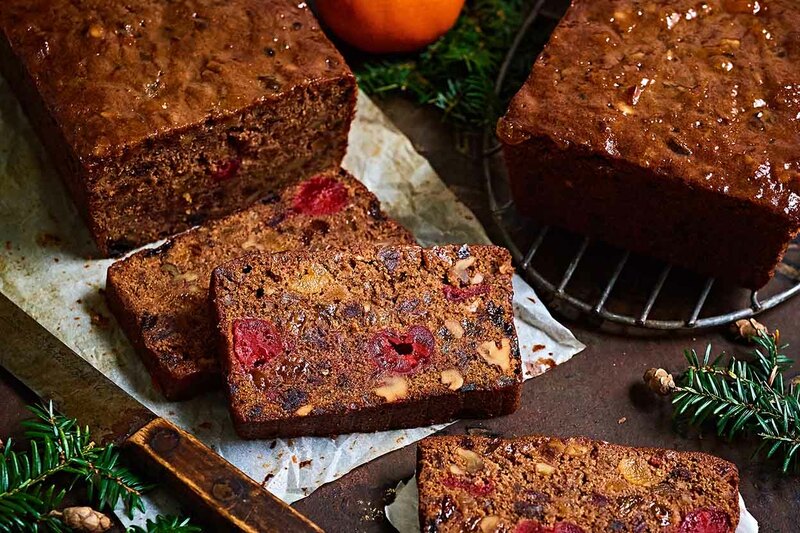 Christmas Fruitcakes are traditional Christmas desserts that are made much in advance so that there is enough in the pantry for the visiting friends and relatives. Children specially love these cakes that are easy to carry and are scrumptious too. If you plan to give some creative Christmas gifts to friends and family, these Fruitcakes are perfect for the occasion. Try this easy cake recipe on special occasions and festivals. You can also make them for kitty parties, birthdays, celebrations, pot lucks and other such events. Ingredients Of Chocolate Cake Layer: 1.5 cups all purpose flour, 195 grams, ½ cup unsweetened cocoa powder, 48 grams, 1 cup granulated white sugar, 200 grams, 1 teaspoon baking soda, ¼ teaspoon salt, 1 cup milk, 1 tablespoon white vinegar, ½ cup canola oil or any flavourless oil, 1 teaspoon vanilla extract, 2 tablespoons water, optional, if needed. Ingredients Of Cherry Syrup: 1 cup water, 2 tablespoons sugar, 1 cup maraschino cherries. Ingredients Of Whipped Cream: 2 cups heavy cream, 16 oz, 2-3 tablespoons powdered sugar. Directions : 1. Pre-heat the oven at 350 degree F. 2. Sift together flour and cocoa powder in a large bowl. Then add sugar, baking soda and salt and mix well. 3. To make the buttermilk, mix 1 cup milk with white vinegar and set aside for 5 minutes. 4. After 5 minutes the milk will curdle a bit, at this point add oil and vanilla extract to it. 5. Add the dry ingredients to the wet and mix until the ingredients are just combined. Add 2 tablespoons of water at this point if the batter seems too thick. This is optional. Remember not to over-mix the batter. 6. Lightly spray two 6 x 2 inch round pans lined with parchment paper with non-stick spray. Transfer batter to the prepared pans. 7. Bake the cakes at 350 degree F for 25-27 minutes or until a toothpick inserted in the centre comes out clean. 8. While the cakes are in the oven, make the cherry syrup. Add water, sugar and cherries to a pan on medium-high heat. You may add more sugar if using fresh cherries. These maraschino cherries are quite sweet so 2 tablespoons are enough. 9. Let the syrup come to a boil and then let it simmer for 2-3 minutes. Remove the syrup from heat and drain it into a bowl using a strainer. Transfer the cherries to another bowl and set aside. 10. Make the whipped cream. Place the whisk attachment and the steel bowl into the refrigerator for 20-30 minutes until chilled. Then add to it heavy cream and powdered sugar. 11. Using the wire whisk attachment of your stand mixer or using your hand mixer, beat the cream with powdered sugar at medium-high speed until it forms peaks. Assemble the Cake : 1. To assemble the cake, first grate the chocolate or use a peeler to shave the chocolate. Use plain chocolate here. 2. Once the cakes have cooled down cut each cake into 2 layers. You will have a total of 4 layers. 3. Place the first layer on your serving plate and brush the entire layer generously with the prepared cherry syrup. 4. Apply whipped cream and then place some cherries on top. You may skip the cherries in layer, this is optional. I also cut cherries in half before adding to the layer. 5. Repeat again with another cake layer. Brush with cherry syrup, apply whipped cream and cherries (if using). Repeat with other layers as well. 6. Finally apply a thick layer of whipped cream on the top layer and also on the sides of the cake. 7. Pat down chocolate shavings on sides in the cake. Place the bigger chocolate curls in the centre. 8. Pipe the remaining whipped cream as rosettes. Top with remaining cherries and serve. I like to place the cake in the refrigerator for couple of hours before serving. Once it's slightly set, it’s easier to cut into slices. Ingredients Of Christmas Fruitcake: 1/8 cup chopped dried cherries, 1/8 cup chopped dried mango, 1/4 cup dried cranberries, 1/4 cup dried currants, 2 tablespoons chopped candied citron, 1/4 cup dark rum, 1/2 cup butter, 1/4 cup packed brown sugar, 1 egg, 1/2 cup all-purpose flour, 1/8 teaspoon baking soda, 1/4 teaspoon salt, 1/4 teaspoon ground cinnamon, 1/4 cup unsulfured molasses, 2 tablespoons milk, 1/4 cup chopped pecans. Directions: 1. Soak cherries, mango, cranberries, currants, and citron in 1/4 cup rum for at least 24 hours. Cover tightly and store at room temperature. 2. Preheat oven to 325 degrees F (165 degrees C). Butter a 6x3-inch round pan or loaf pan and line it with parchment paper. 3. In a large bowl, cream together butter and brown sugar until fluffy. Beat in the egg. Mix together flour, baking soda, salt and cinnamon. Mix into butter and sugar in three batches, alternating with molasses and milk. Stir in soaked fruit and chopped nuts. Scrape batter into prepared pan. 4. Bake in preheated oven for 40 to 45 minutes. Cool in the pan for 10 minutes, then sprinkle with 2 tablespoons rum. 5. Cut out one piece parchment paper and one piece cheesecloth, each large enough to wrap around the cake. Moisten cheesecloth with 1 tablespoon rum. Arrange cheesecloth on top of parchment paper and unmold cake onto it. Sprinkle top and sides of cake with remaining rum. Wrap the cheesecloth closely to the surface of the cake, then wrap with paper. Place in an airtight tin and age for at least 10 weeks. If storing longer, douse with additional rum for every 10 weeks of storage.